Jaguar gained eyeballs with its recent release of Jaguar XJ 2016. The high-class model is speculated to be in market by autumn 2015 and king the details shared by company, anticipations are that it’ll be a milestone for the automotive industry. The entire XJ range will include, XJ Luxury, Premium Luxury, Portfolio, R-Sport, XJR and XJ Autobiography. 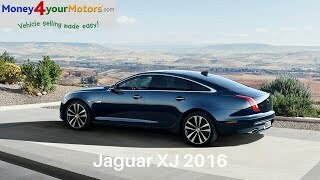 Let us have a look at the review of Jaguar XJ 2016 to know more about it. The interior of Jaguar XJ 2016 is amalgamated to present comfort and technology. The luxurious interior is drenched in innovative and class-leading features starting with the cabin you have a customizable eight-inch capacitive touchscreen offering you complete rights to choose the wallpaper and widgets for features you use most and make them all just a touch away. The screen is designed in a way that it won’t take much from the driver and he can easily concentrate on street. The InControl Touch Pro premium infotainment system is remarkably powered by quad core processor and features 60 GB solid-state drive and a next generation Ethernet network. The system learns your daily drive and subsequently offers you alternative routes with real-time traffic information. Rounding up the interior of Jaguar XJ 2016 all I would say is, it’s a commendable combination of technology and comfort. The exterior of Jaguar XJ 2016 comes with subtle changes. Starting with the front fascia amidst the LED headlights sits an upright grille while outboard air intakes splatter aggression through the sculpted chrome blades. The ‘quad lamp’ headlights feature auto high beam assist and static bend lamp functions. Beneath this set up are the twin daytime running lights that give truly stunning look to the front fascia. Moving over to rear end you’ll notice LED lights that feature J-signature tail with a new blend giving the model more distinctive look. The bumper comes with gloss black valance and a slender chrome insert. 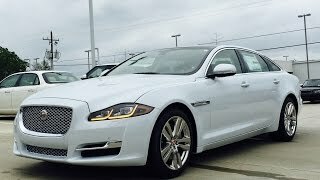 In all the exterior of Jaguar XJ 2016 is classy and aggressive bringing for its buyers, quality that is top-in-class. In all there are seven powertrain options beneath the hood of Jaguar XJ 2016. The engine option includes 3.0 Diesel, 2.0 petrol, 3.0 liter supercharged petrol (two variants) and .0 supercharged petrol three variants generating total output of 300 hp, 240 hp, 340 hp, 340 hp, 470 hp, 510 hp and 570 hp and peak torque of 700 nm, 340 nm, 450 nm, 450 nm, 575 nm, 625 nm and 680 nm respectively. All the engines come paired to ZFHP 70 eight-speed automatic transmissions. 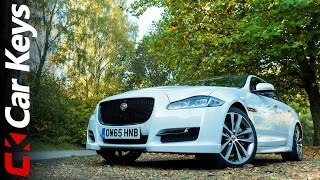 While the top speed of Jaguar XJ 2016 variants touches 155 mph (except 2.0 petrol: 150 mph and 550 hp 5.0 supercharged: 174 mph)the 0-60 mph sprint can be knocked in 5.9 seconds, 7.5 seconds, 5.7 seconds, 6.1 seconds, 4.9 seconds, 4.7 seconds and 4.4 seconds respectively.